The presidential election has made us more aware than ever that we are seeing the world very differently than neighbors, family members and colleagues. Many are reflecting on how to proceed next. One option is to believe that people with opposing views “just don’t get it” or worse are not intelligent or capable. We may go so far as to polarize the others and see them as less than human. Name-calling and even violence may evolve. While having negative views of the other may be a natural first option, it has costs. We could be curious about the other’s perspective and even look to learn more. When we speak to someone with a different perspective with genuine curiosity (rather than criticism or contempt) we are likely to learn of a different perspective based on what they are seeing. As we give empathy and listen, we are likely to find common ground. From there we can build agreements. When we don’t listen, we don’t learn or see new possibilities. Sometimes we need to get empathy from others and be self-compassionate before we can engage with other perspectives. 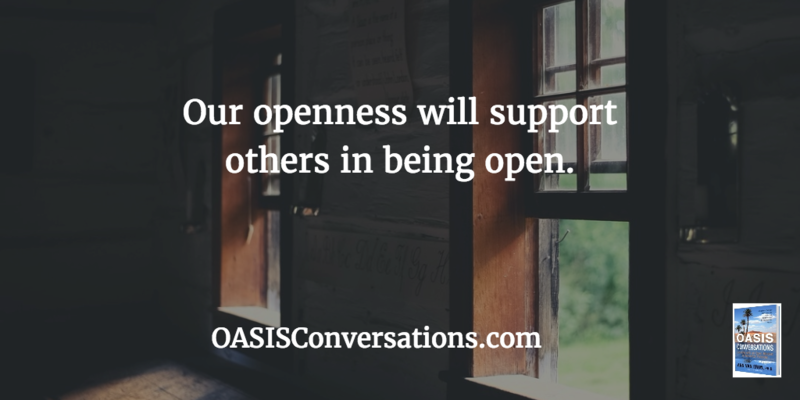 Our openness will support others in becoming open. Ideally, we will be able to live with each other among our differences. This entry was posted in Communication and tagged Openness, Positive Change by Ann Van Eron. Bookmark the permalink.